With this theme and the use of MyArcadePlugin Lite or MyArcadePlugin Pro you can take your arcade community to the next level. This theme has everything you want from a arcade theme. Try the live demo to see for yourself! Our powerful admin panel allows you to manage various aspects of your theme functions with a few clicks. The theme can be entirely translated using .PO files and seamlessly integrated with populars localization plugin. Finely tune the style of your theme in seconds thanks to the built in color editor that allows you to create unlimited number of color schemes within a few minutes. Game interface on game post pages with the ability to easily share, like, rate, link, embed, rate, turn off lights and skip from one game to the next. Sort games by date, title, views, likes, comments, random and up or down on category and tag pages . The advertisement areas on this WordPress Arcade Theme are perfectly integrated to boost your ad clicks. 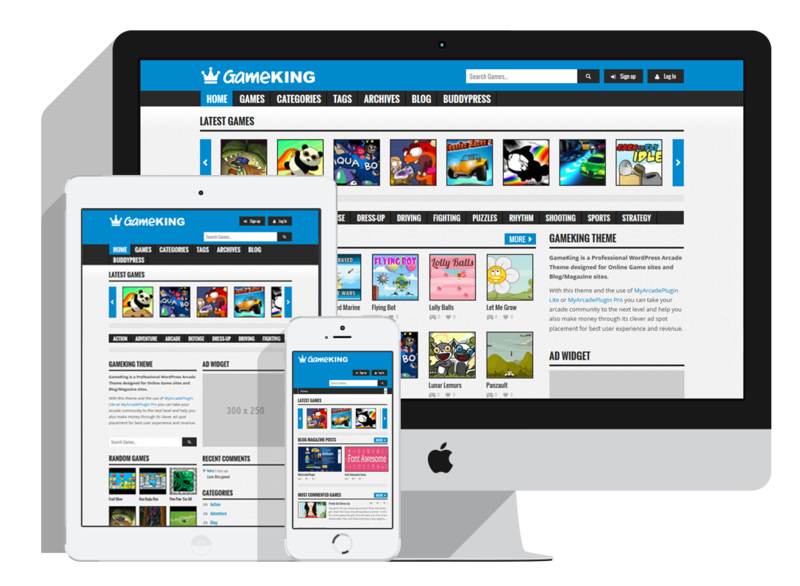 GameKing is a fully responsive WP Arcade Theme. It adopts automatically to different screen resolutions and it’s perfect for mobile devices. This is a arcade theme but you can still create standard blog posts. Specify a default layout for all of the posts, and you can override this setting for individual posts on edit post page. You can use this WordPress Arcade Theme with Buddypress and easily build a active community for your arcade site. Attract visitors like flies with the use of Yoast SEO plugin, GameKing is ready made for this great SEO plugin you only need to install and activate it. This arcade theme has all kind of handy widgets to display your games, posts, ads and everything else you want to have on one of the seven sidebars. 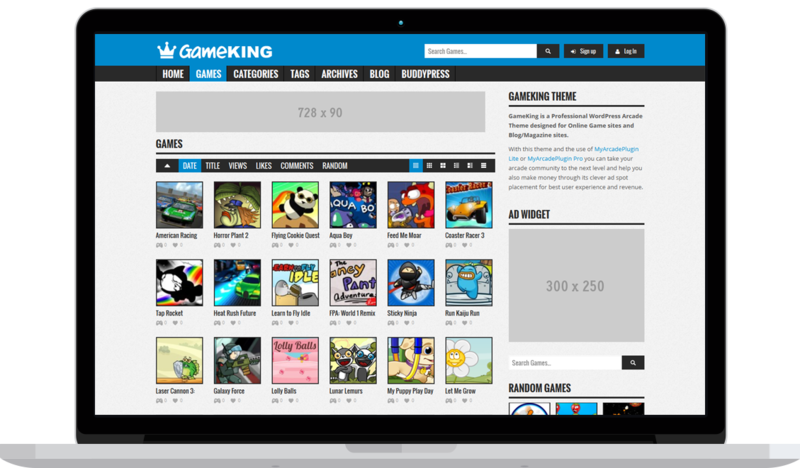 Users can like games so they will be saved on their profile and to easily find the most liked games. 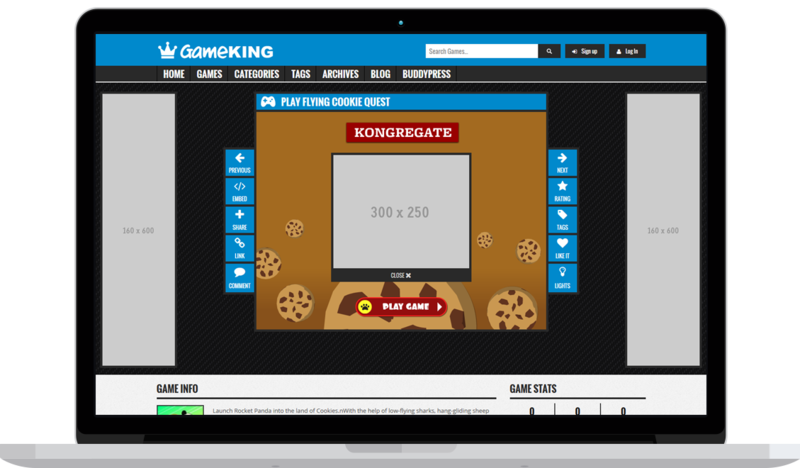 Responsive game interface design with great user functions for games of any size and optimized placement of ads. Home Page Settings. Here you can create all kinds of section boxes for the homepage and choose what category there from, how many posts to display, how to sort and view, put in ad code and more. General Settings. Easily upload you logo and favicon or use a text logo, enable menu navigation, responsive and Addthis and Rss. Design Settings. In the demo the main color is blue but you can change all elements with unlimited colors using the color code pick boxes. Also you can select a body background color or use a seamless pattern. Footer Settings. Enable footer navigation in footer area and set the social links and other footer text. Archive Settings. Determine how to display posts on archive pages and select what sort types and view types you want to use. Home Carousel Settings. Settings for the autoscroll post carousel on the home page. Category Carousel Settings. Settings for the autoscroll post carousel on category pages. Single Post Settings. Specify a default layout for all of the posts, and you can override this setting for individual posts in ‘Post Layout Settings’ panel on edit post page. And select how many related posts should be displayed. Post Like Settings. Settings for using the post like function. Ads Settings. Here you can paste your ad codes and choose where in the theme to place them. Hook Settings. Here you can paste your Analytics tracking code or any other code you want in the head or footer section of the theme. Great options for sorting and viewing games on category and archive pages. Can be controlled on admin panel.